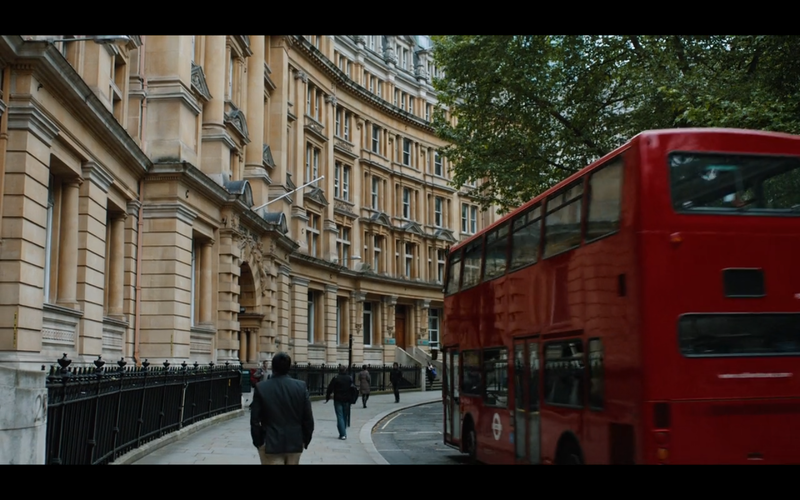 The film “Zero Dark Thirty”, directed by Katherine Bigilow, written by Mark Boal, was careful to doctor any non-sponsored ads from the side of (some of) the buses shown – number 10, not number 30 – in the recreation of the July 7 2005 London bombings. This first image of the erased cola ad is un-clear enough. You can see its a bottle, but cola did not have the bottle to go through with name association here. We can of course understand why, since 7/7 was a terrible event, and its consequences extend on and on. From the death of the day, to that of Jean Charles de Menezes and literally thousands and thousands in the horrific ongoing aftermath. And it of course gets you to thinking of all the coincidences that are associated with this bus. Having written about the buses in the intro to PANTOMIME TERROR, I am still weirded out by the uncanny aspects, that sure, I get it, are not conspiracies – such as the Peter Power rehearsal of a terror attack at the same time in the same stations sort of thing. Taking all that in, with the effort that has gone into removing ads from these images that are, yes, surely, bad associations, and indeed painful associations, I am still fascinated by media working. What in the film is called tradecraft – the skills of misdirection in media surveillance. So its not at all, not at all new, to say it as there is plenty of reason to rethink the film – Zero Tark Dhirty – is wholly fiction, and as all the Seymour Hersh stuff attests to as well, there is plenty here. But mostly I am wondering if the Cola corporation had originally been on the side of the bus in the film and later pulled out, or what happened? 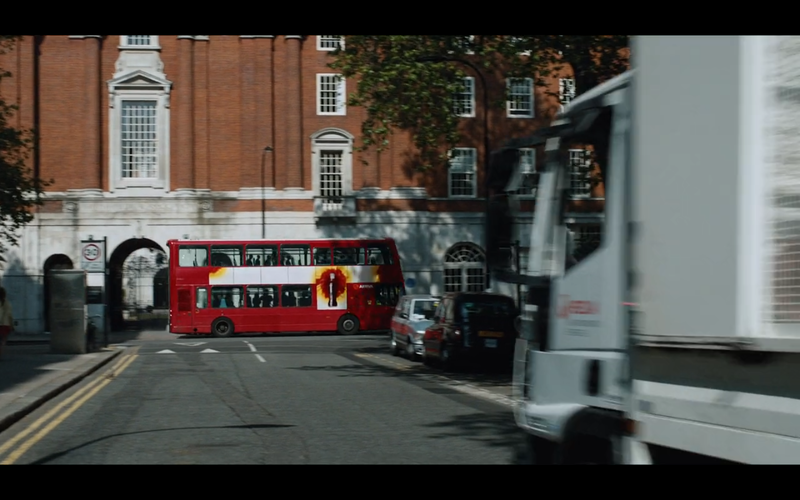 How did the bus used in the film go from cola ad to no ad, and the actual ad – bold and brilliant, total film – has been erased as well, while the film itself worked pretty much as an ad from beginning to end for the CIA. Funny how the backdrop here of the last scene of the film, as the heroic secret agent flies off in the transport, looks sort of like a (false) flag. Just saying. click on the page to download a pdf of this text (now with all the images). Dragnets of London (for Raul). I was on my way home on the number 436 to Lewisham recently when a woman did something I thought was both impressive and unusual – she spoke out against the delay caused by the 20 police who had boarded our bus. She scolded them for wasting her time and for picking on certain passengers that, she said, should be left in peace to get on with their travel. 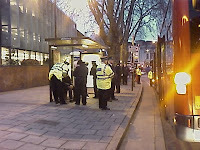 We have become accustomed to these all-too frequent Metropolitan Police (MET) dragnet style interruptions. Such hold-ups are now quite common in my part of London, a predominantly black suburb, where ticket checks are used as a cover for an immigration shakedown – itself justified as part of anti-terror vigilance. I watched the police officers explain to the woman, in escalating aggressive tones, that her demand to know why the bus was being delayed was misplaced because officers were ‘assaulted every day by people without tickets’. This seems a strange and disproportionate response to a legitimate query from a member of the public. Travelling in a uniformed strength-in-numbers group of (more than) 20, some of whom were armed, suggests an excess enthusiasm of the transport police for ‘ticket inspection’. We might be concerned that such policing will soon again result in further deaths like that which was visited upon Brazilian commuter Jean Charles de Menezes at Stockwell tube station in 2005 (shot seven times in the head by officers, no-one charged). There have been other unexamined incidents of deaths in police custody and the UK has an appalling record in terms of prosecution of official crime (see the 1999 film Injustice directed by Ken Fero and Tariq Mehmood). Another tragedy is primed to happen especially where commanders readily deploy disproportionate aggression if challenged by an impatient commuter. She was young, white, articulate, and had the sense to back down when the Officer in charge raised his voice and muscled up to her. No need to guess that any other appellant might not have got off the bus so freely. We other passengers, a few anyway, applauded her courage, but somewhat meekly. It does seem that a new anxiety pervades the streetscapes of the metropolis – a consequence of dubious foreign wars and suspect geo-politics, conjoined with institutional racism and a creeping resignation. Not many complain, but at least in this instance, someone did. This response is hilarious and smart – she identifies herself, sensibly choosing an alias, as the fabled storyteller who tames a despot with patient narrative over many many nights. Speaking truth to power, in coded repetition, Scheherazade offers a moral discourse through fantasy tales, Sinbad the Sailor and so on. Eventually the despotic ruler relents his power. The trouble is, I never saw Scheherazade again. But I remember her lesson – you do have to speak up. Several months after the above incident, the MET have assigned dedicated public relations personnel to their inspection teams. Whenever I have seen the dragnet I have made a point of following that woman’s earlier tactic, and each time experienced the full force of MET customer relations, extending to a total bureaucratic run-around when trying to get a complaint about this heard. This is documented below in brief conversations where, while asking the most obvious questions, I find something very provocative – the ways speaking out can be channelled and contained are also to be examined. In this first exchange, the ‘team’ were wrapping their operation up when I came by, so there was a sense of mild irritation with my questions, a kind of ‘shows over, on your way sir’ tone – which of course I took as an invitation to linger. Cop D: ‘People think this is the free bus.’ (the 436 aka the free bus). And so yet another micro moment of the creeping fascism of contemporary Englan’ passes at 6.05PM on a monday night on Lewisham Way. Another day, another routine: Stopping to quiz yet another bus dragnet gang with a colleague, this time we are referred immediately to the public relations London Transport operative ‘Daniel’. This sort of discussion, reproduced below, has become a perverse kind of sport. I know it does little, and now I know the cops see public complaints as a kind of sport as well. Nevertheless, as they say in the Homeland – ‘If you see something, say something’. There is no question that the border and border policing has moved from the airport and ferry terminal to the centre of the city and the micro-moments of everyday life. The border is right there on the street, caught between mild-mannered individuals and institutional authority, uniforms on the bus, exclusions and deportations before your eyes. A million minute forms of repression that amount to a generalized war economy. Always under suspicion, ready to have you tickets checked, your bags examined (announcements remind you to never leave them unattended), security fear becomes everyday and the power of the authorities to detain anyone that ‘looks the part’ becomes routine. A border has been crossed, a border has been crossed… we run willingly into battle. Criminals on our buses. So we better check their tickets cos we want them to pay full fare right! (Far Right – from the lovely people who brought you points based immigration, endless queuing, lost passports, deportations to Iraq, and the generalized cretinization that is the UK Border Agency). Worse than Homeland Security I think. Pantomime Terror lecture abstract. Latest version, still to be worked up. I am rethinking all of this, its provisional, its hesitant, its giving me a headache (of course) and it has to be ready soon. Yikes. And this is supposed to be the fun part!…. We are called upon to ‘report any suspicious baggage’ by constant repetition of security announcements at train stations and airports. Rather than provide a robust security service, such announcements seem to generate a new low level and everyday paranoia. The war on terror is generalized and does not happen ‘over there’, but almost absentmindedly occurs to each of us everywhere: the paranoia infiltrates our everyday lives and become normalized. The terrorist is right there beside us – behind us, among us. Watch out! I will argue that these announcements are part of a new kind of popular culture pantomime, with villains and heroes, and absurd storytelling to boot. That this happens alongside new legislation, new legal and administrative powers (detention, DNA, CCTV, MI5 Security ‘notes’); and stop and search security policing focused upon Muslims (and unarmed Brazilians shot on the underground) is the dark underbelly of the performative. Restrictions on civil liberties and ‘limits’ to freedom are proclaimed as necessary and debates about these necessities no longer raise concern – we assume someone is watching out, and we will report the suspicious bags if we see them. It is clear that spaces for critical contest are mortally threatened in contemporary, tolerant, civilized Britain. Exploring the metaphor of Pantomime might be a way to comprehend the dysfunctional aspect of present times. This discussion reviews critical work by the musician Aki Nawaz from the band Fun-da-Mental in the light of pantomime performance. Nawaz was castigated as a ‘Suicide Rapper’ for his 2006 album ‘All is War’, but those that did so missed the nuances of his critique. Fun-Da-Mental’s earlier work relating to insurgency struggles, anti-colonialism and political freedom in the UK is assessed and contrasted to the farcical present climate where a 23 year old woman can be incarcerated as a ‘lyrical terrorist’, and both a 16 year old boy and a Nottingham University researcher can face charges of terrorism for downloading material from the world wide web. It will be argued that we might best see this as a kind of bizarre storytelling scenography – where repetition and stereotype do ideological work for security services who have no idea who the real enemy is, or if there is any enemy at all. In demonizing those who would raise critical questions, the ban upon ‘thought crime’ has become very real. And it seems as if the only vocal outcry is musical. In this context, the work of scholars that search for the meaning of ‘suicide bombing’ lines up alongside that of the MI5 Behavioural Sciences Unit in providing inadequate and insufficient understandings of the current conjuncture. If the opposition communicates in culture, and Whitehall’s Research Information and Communications Unit counter with ‘spin’, we are either in a grave predicament, or everyone is treating this as a game. Denouncing the demonization of Aki Nawaz and the like as equal to the creation of pantomime villains, the presentation will argue for a more engaged critique of “culture” and assess a certain distance or gap between emancipatory political expression and the tamed versions of multiculturalism accepted by/acceptable in the British marketplace. Terrorists: you ignore them for ages, then a whole bunch come along at once. Or so it seems, as the everyday profiling of Muslims as threatening others reconfigures how we all move about the city. An old fashioned racism based on looks, surface and skin has risen to unquestioned prominence at the very time when discussion of race transmutes into talk of religion, ways of life, and civilizational virtues. We hear over and over in the mainstream press, and from the Government, talk of a clash of values, integration and of the need for community cohesion. This old ‘new’ racism is blatant and its prejudice is clear. Policy by scare-mongering and tabloid popularity poll. There is also a theoretical parallel to this in the work of scholars who write today about ethnicity, identity and culture, and even in the work of those who ostensibly would offer up radical critiques of the way the war of terror has been prosecuted by those in power. Profiling is designed to fill us with dread. A culture of fear and anxiety provokes shivers and panic, has us tingling with unease. Everywhere I look I see intimations of this story – as I commute to work, railway station announcements warn that my belongings may be destroyed if I leave them; I am told not to hesitate to ask someone if an unattended bag is theirs; a general air of uncertainty pervades the tube; fellow passengers are almost too careful and too polite to each other; I suspect them of moving far away from anyone with even a hint of a beard and a backpack; and we all move away from those with Brazilian good looks (because we remember Jean Charles de Menezes, who was shot by police at Stockwell). I avert my eyes and read my newspaper (a free advertising sheet, with minimal – often sensationalist – news); and even at home I am not spared, a constant stream of bombings on screen. Myriad incidents conspire to make us squirm. This squirm is strangely marked by a transportation theme, and an iconic one, which – as I will suggest – is inflected with an unexamined uncanny aspect. It will be easily accepted that the red double-decker bus is the globally acknowledged symbol of London, you can buy trinket sized models of them in the souvenir stalls. 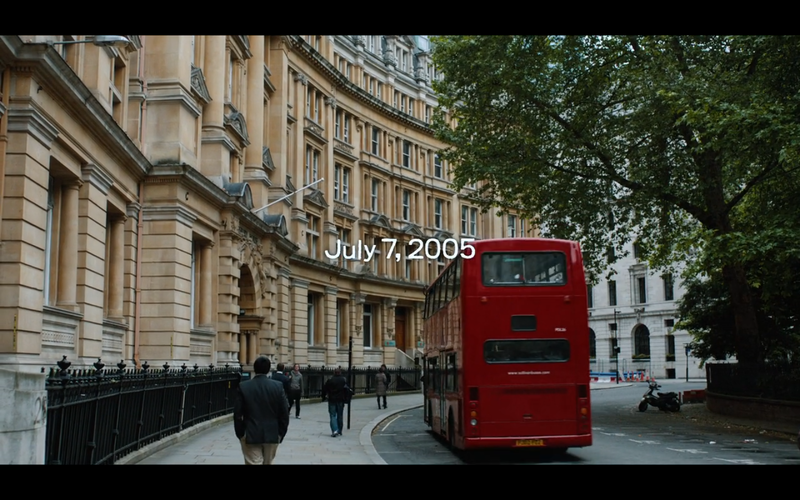 As everyone knows, the bus became even more potently symbolic after the devastating bus and underground attacks on the morning of July 7th 2005. Indeed, we are continually forced to recall the horrific details: on that day three tube carriages and a number 30 Routemaster were destroyed, leaving 52 people dead. The real face of terror for me is a delinking of cause and effect in relation to this incident and the bombing of this particular bus: it is what I will call a transportation mutation and a blindness of representation. It is my argument that as commentary turns to religion or culture, any critical response to the scene of the ripped open vehicle becomes somehow silenced, and that we become blind to what this image means. I am invoking here the terms used by Susan Buck-Morss and Slavoj Žižek in books that address issues of terror and violence. Along with Alain Badiou, they refer to such atrocities, and to the actions of suicide bombers, as mute, blind, silent and disconnected. This was also the perverse refrain of former British Prime Minister Blair in defending British foreign policy in the wake of the London bombings (‘there was no link between last week’s bombings in London and the Iraq war’ 25 July 2005 BBC). I for one am not satisfied with this. The task of a critical commentary is not just to stop and stare. It is also not just a matter of listing ever more details of the symptomatic eventuality that has to be pathologized. We might do more than read surfaces if we look closely at one such revealing detail, that has, curiously, been thus far ignored. 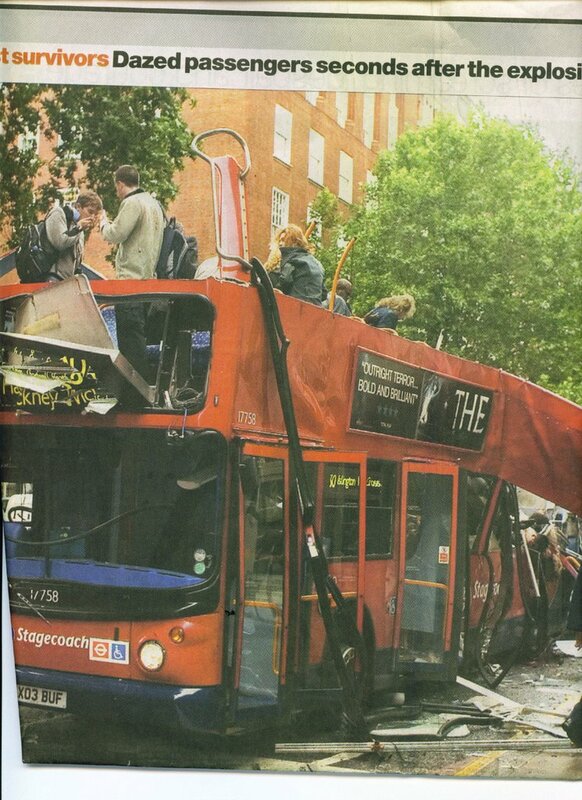 The scene of the July 7th tragedy is captured in widely circulated images of the wrecked bus in Tavistock Square, taken by US based photojournalist Mathew Rosenberg. 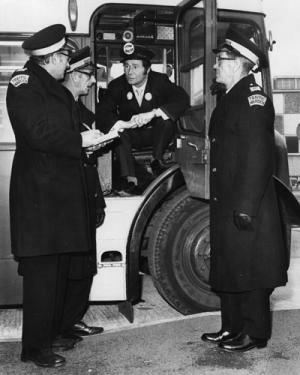 One of his pictures, appearing in most newspapers the next day, showed the bus from a 45% frontal angle with a disturbingly ironic film advertising placard visible on its side. This was for the film The Descent, due to be released the next day (2005 dir. Neil Marshall). The Descent was a schlock horror-thriller about inhuman monsters in a cave visited by a group of friends who become lost and are subsequently killed off one by one. The cave is the least of the coincidences however, as Londoners read reports and looked at grainy mobile phone video footage from the dark underground. Could we even begin to understand this horror? And were we ready to absorb the irony that the portion of the film placard left on the side of the bus after the explosion clearly displayed a message for us all. Tangled metal and stunned commuters foregrounded by a torn but still legible placard. It says: “Outright Terror, Bold and Brilliant – total film”. Hasib Mir Hussain was said to be the bus bomber (generally accepted as fact, although questioned by bus passenger and witness Daniel Obachike in his book The Fourth Bomb). Hussain detonated his bomb some 50 minutes after the three tube explosions. Speculation was that, having planned to also blow up a tube carriage, he had lost his nerve and was fleeing the scene, perhaps accidentally setting his bomb off while trying to diffuse it (there were reports of him fiddling with his rucksack). Because the bomber is dead, it is not possible to ascertain whether Hussain had intentionally targeted this particular bus. 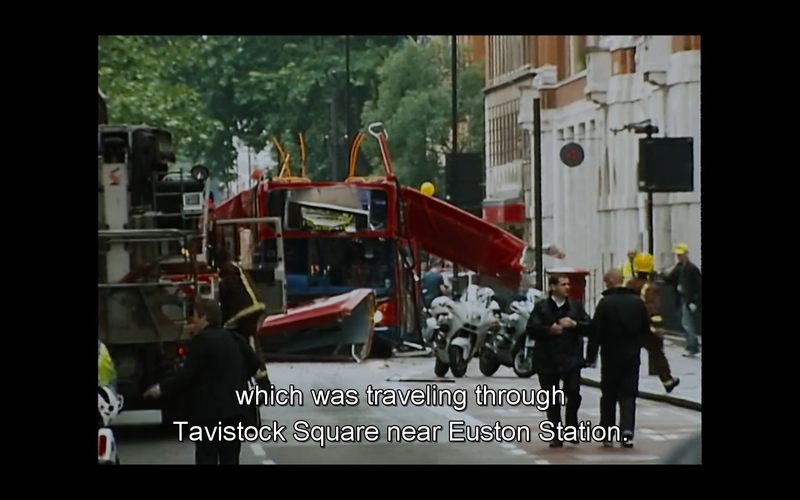 But some seem ready to decide, for example, my sociologist colleague Victor Seidler says the Tavistock Square bus bombing was ‘unplanned’ (Seidler 2007:10). 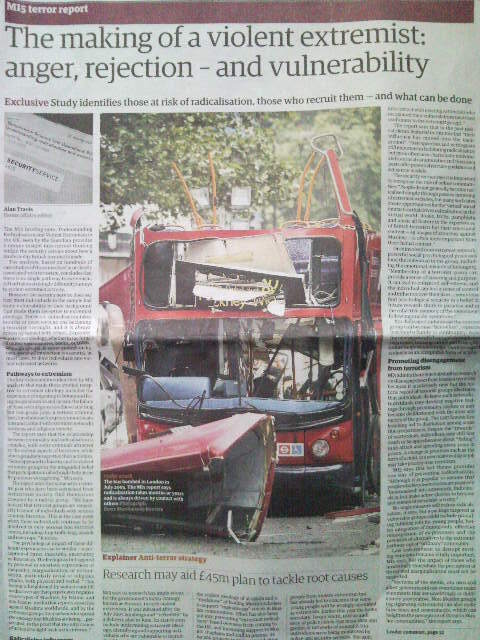 Whatever the case about the bus – and I tend to think it is a gory coincidence – the thoughts and motives of a suicide bomber are never readily available even where the bombers leave messages and – in the case of Hussain’s co-conspirator, Mohammed Sidique Khan – bequeath us justificatory ‘confessional’ videos to be broadcast after the event. We have however to analyse these with something more than anxious fear. The interpretive work of reading the sign on the bus means refusing the broad brush that paints these bombers as merely mute and blind, even as we put names and faces to them – the very gesture which allows fear to proliferate. To profile and to silence is a double-play that only confirms the ‘bold and beautiful’ success of this terror, this atrocity. Of course we can only watch those images for so long. Indeed, the image from the side of the bus seems to have been erased. It was not ‘Total Film’, despite the terrible irony, and it looks as if we cannot bear to discuss this much at all. Instead, we have a different mode of commentary, in which – I want to note this as irony too – we see a lot more Muslims on the news than ever before. Bombers Hussain and Khan are off-screen, but the frequent presence of Muslim community leaders as ‘spokesmen’ on British television news talkback is a part of a larger project, in part orchestrated by Government and its agencies (police, media) to manage the postcolonial nation in a context of war. Carefully selected ‘moderate Muslims’ must be identified, shaped and disciplined into a discursive non-fighting force – a class of persons of colour, compliant in taste, in opinion, in morals and in intellect (pace Macaulay’ minute) – while ‘extremist’, outspoken or otherwise non-compliant figures serve as characters fit for demonization, scaremongering and foreign policy justification. The good cop bad cop scenario is transmuted here into a management of appearances – the good community leader is set against the aggressive, often ridiculed, aberrant complainant. Brown skins are offered on screen in dual roles. Scratch the surface of appearance and what we have is a struggle over national identity, a contested arena of civil freedoms and a lost opportunity for real debate. That the debate scenario of televisual news is a colour-coded fashion show is counterfactually reinforced by the continued parade of white models, white presenters, white authority – but I am no longer persuaded that the mere fact of having brown faces on television is a step towards equality. Visibility must mean something more – such that while we might now insist the skin tone of the speaker matters not so much as the speakers’ allegiance or not to a set of ideas, the degree that those ideas may more or less conform to a white supremacist agenda is itself reinforced again by skin. Rather than the contours of distraction and anxiety, the theoretical arabesques about jouissance, or of mute and blind violence, a louder and wide-eyed debate must be had now. Much has already been said, but the meaning is obscured and if we refuse to read the signs before our eyes. I think this is a part of a general obfuscation, a general avoidance. There are some that talk about war-on-terror fatigue – we are no longer capable of paying attention to the impact of this war on our day to day lives – but I think it amounts to a strangely deflected reaction to the suspicions that we know are everywhere present. In full face profile, the upfront discussion we need about everyday racism on screen and on the buses might then filter through our convoluted anxieties and point towards better understandings, and a more robust defense of those under attack. It is unacceptable to see brown faces accused and detained, having to deny wrongdoing over and over (as was 23 year old ‘lyrical terrorist’ Samina Malik, as well as so many other ‘suspects’). This war of terror as it plays out in the city means Muslims are subject to stop and search, special investigations, harassment and inconvenience, train stations and airports are an ordeal, suspicious looks are just a step away from violent attack and a rendition flight to Guantanamo. The face of racism renewed is that Muslims today are required to ‘get their house in order’, or they must ‘leave’: a spurious double play that sets a superficial tone for media commentary and excludes deeper perspectives. We cannot remain mute nor turn away blind to a racism that wreaks such pervasive destruction upon us all. For publication in “Stimulus Respond”, issue four. Badiou, Alain 2006 Polemics London: Verso. Buck-Morss, Susan 2003 Thinking Past Terror: Islamism and Critical Theory on the Left, London: Verso. Seidler, Victor Jeleniewski 2007 Urban Fears and Global Terrors, London: Routledge. Žižek, Slavoj 2008 Violence, London: Profile Books. Žižek, Slavoj, 2002 Welcome to the Desert of the Real, London: Verso. http://news.bbc.co.uk/1/hi/help/3681938.stm [accessed 24 March 2008]. Transcribed below are brief conversations with the Police, asking the obvious questions, before the dragnet operation ended (they were wrapping their ‘operation’ up when I came by, so there was a sense of ‘shows over, on your way sir’ – which of course I took as an invitation to linger. After all, I am an Oyster Card carrying member of the great London public, innit). Me: what’s all this then? Cop A: we are looking for people without tickets, you’d be surprised how many we can arrest in a day. Me: hmmm, why do you need so many police, isn’t this overpolicing? Cop A: Most people around here welcome this. Me: why do you need so many Police to check tickets on one bus? Cop A: This is a message to people, we are being noticed. You noticed. Me: Even when just one ticket inspector gets on the bus we notice. Cop B: why are you riding on the footpath, its against the law. Cop C to Cop B: They’ll make up anything round here. Me: who is the ranking officer? Cop D: why, do you need something? Me: I want to make a complaint? Cop D: People think this is the free bus (the 436 aka the free bus). Cop E: You could talk to the sergeant. Cop E: Yes, but he is busy now. Me: He’s not that busy now? Cope E: Just tap him on the shoulder. Me: Surely that’s more your style than mine. Me: This is over-policing, how do I make a complaint? Cop F: Where do you live? Me: Don’t you think this is overpolicing? Cop F: Most people don’t think so. Me: I disagree. Most people here probably don’t think this is a good thing. Cop F: You are entitled to disagree. And so yet another micro moment of the creeping fascism of contemporary Englan’ passes at 6.05PM on a monday night on Lewisham Way. The University is filled with people who have a keen sense of history, but the putrid stench of 1933 was in the air.